To climb or not to climb the Big Daddy Dune, Sossusvlei, Namibia? 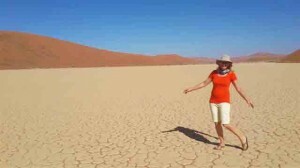 The Namib desert dunes have been there for millions of years. 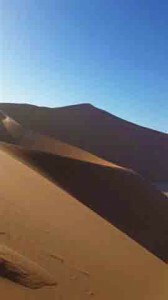 Some believe it was the sand of the Orange river that was spilled into the strong Benguela current and carried back on land by strong winds that created these staggering high red sand dunes. As we were staying at Kulala Desert Lodge, a Wilderness Safaris property we were able to enter the Park via their private gate which opens at sunrise. 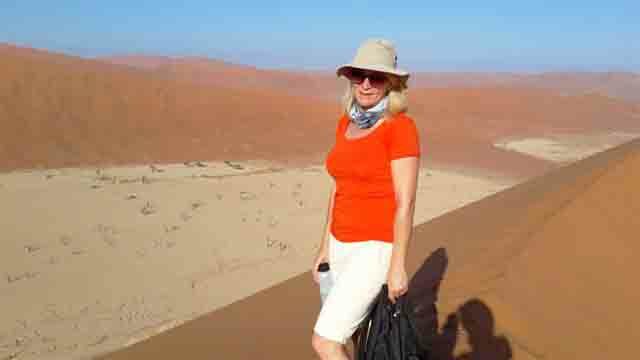 Most self-drive clients have to travel via the Sesriem Gate which is about an hour’s extra drive to get to the start of these dunes – so it’s worth booking a guided tour even if you are booked on a DBB basis. The government owned SossusDune Lodge and the campers at Sesriem campsite are allowed to set off one hour prior to sunrise but everyone else has to queue at the Main Gates which open at sunrise. In order to have a dune to themselves, Kulala guests typically bypass Dune 45 and head straight to Big Daddy. 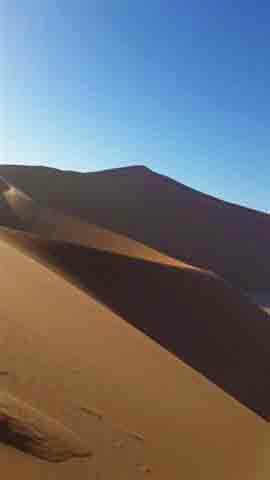 We arrived just after 7.15am at the parking for Big Daddy and the Dead Vlei and then started our steep climb up to the first plateau. Climbing even this first ridge of Big Daddy offers stunning views of Dead Vlei and most people choose to stop after they reached that point (around a 45 minute of huffing and puffing). After only half an hour, I think we realized what a huge task we had taken on. It was December and so the African sun was hot even at that time of the morning. After the first ridge, you actually go downhill again. Though the short relief from the relentless climb was welcome, I couldn’t help but rue the meters of hard-won height that I was losing. Then we started the main ascent. 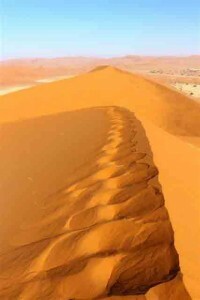 It is not the height of the dune that is the issue. Even though it is the highest dune, it is still only 380 meters, just over 1100ft. No, what kills you is the soft sand into which you sink and slide downwards. As we began to climb again, I found myself counting under my breadth. I allowed myself a rest after every 60 steps. About half way up the ridge was a patch of soft sand. It was only 30 meters or so but I felt as if I was climbing Everest! For every step you took, you sank back. In the end I found the easiest option was to stick my bum in the air and use my hands to climb like a monkey. That worked and then we were over the worst of it. Now began the easier but still slow slog to the top. 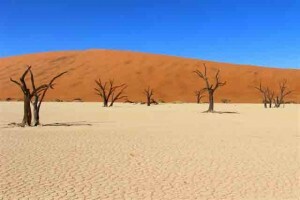 Our only issues now was the lack of water. A one liter bottle is not enough in December (and probably at any time of year) and the rising heat. I found that I was down to counting out only 20 steps before I stopped. But the end was tantalizingly close. The dune ‘summit’ seemed only a few steps away but of course mountains, even dune mountains, are cunning in that way. But at last we made it! 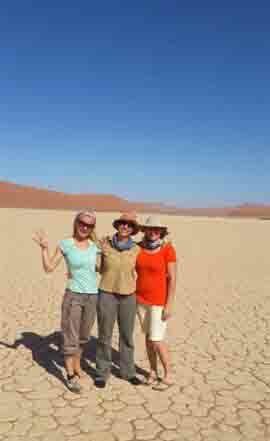 Once we reached the top we were filled with joy, posing for photos, but also rewarded with stunning 360 degree views over endless red sand dunes and the Dead Vlei far, far below us. It had taken us just over 1.5 hours to climb up (with most people taking around 2 or more hours enjoying more leisurely breaks), but it took us only a few minutes to come down. The air trapped in the sand makes a roaring sound as you bound down the dune – magical! Yes it was a tough climb – tougher than we thought it would be but we felt a real sense of achievement. 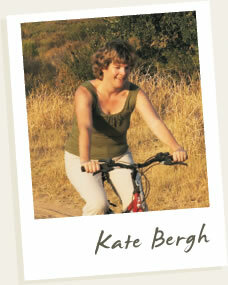 We also felt that we had ‘earned’ the delicious picnic brunch that we had under the trees next to Sossusvlei. A picnic had never tasted so good. Big Daddy would not be the first choice for everyone (we were the only ones to attempt it on that hot December morning) but it can get busy during the peak season from June to September so try to get there as early as you possibly can – otherwise you may feel that you are in a queue. Take lots of water – ideally at least 2 liters in the summer and 1.5 liters in the winter. Don’t give up – just take frequent breaks. Choose either walking boots or bare feet. 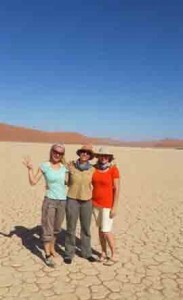 Trainers with breathable mesh are not ideal as so much sand comes in, that your toes are squeezed by the sand! However if climbing bare foot in summer, take trainers with you as the desiccated white sand of Dead Vlei can get very hot in summer very early in the day. Though we were quite proud of our time as being faster than normal, we also marveled at the record held by a Wilderness Safaris guest of just 19 minutes. 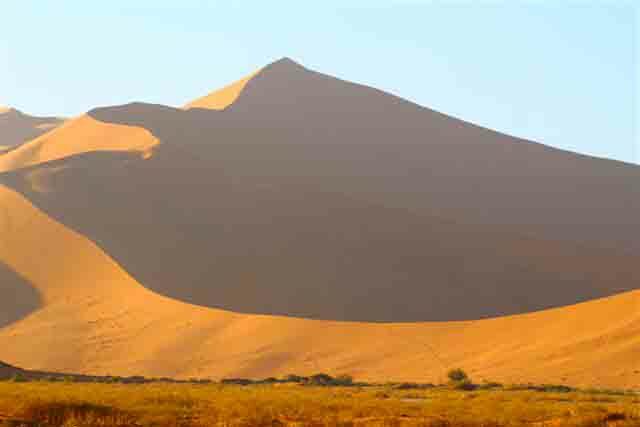 The only way to do that is to take the most steep direct route up the highest part of the dune, instead of via the ridge from the side which is how most mortals do it. We can only but wonder!